Ayahuasca, the holy sacrament which the indigenous people and Shamans of the Amazon have known as a powerful holistic purgative medicine capable of great healing and transformation for thousands of years. 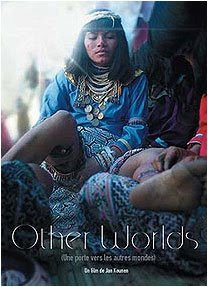 The film 'Other Worlds : A Journey Into The Heart Of Shipibo Shamanism' by Jan Kounen primarily shows the therapeutic power of the Shamans and their plant teachers. This power is a type of ancestral psychoanalysis or human psychotherapy backed by 4,000 years of experience and practice. Ayahuasca is a powerful purgative and curative mixture which is used by the shamans of the Amazon to commune with the spirits, who then oversee the healing of the person who drinks the Ayahuasca brew, while the shaman guides the healing session and appeals to the spirits on behalf of his client. Amazonian shaman, Javier Arevalo, who serves the community of Nuevo Progreso had a patient who was HIV positive and had been in hospital a fortnight. Javier says, “That night we drank Ayahuasca and I saw in my vision that HIV was like the devil destroying him and that he was getting worse. “He stuck to the Ayahuasca diet for two months and he also took bitter tasting herbs which cure internal wounds. After three times [three Ayahuasca sessions] he was better and, when tested, proved HIV negative”. The Pulitzer Price-nominated author, John Perkins, who has written extensively about Ayahuasca usage among the Shuar Indians of Ecuador, has confirmed other ‘miraculous’ healings. “During the ten years we have been taking people to meet the shamans, there have been a number of remarkable stories”, he says4 – among them, cures for deafness, depression, weight loss, as well as endless accounts of life changes and new visions for a different personal and social future. The brew blended in careful measure, contains Ayahuasca vine (Banisteriopsis caapi) and leaves of the chacruna plant (Psychotria viridis), often with datura and pure jungle tobacco, which cause the purging qualities that ayahuasca is famous for. The final mixture is also known as ayahuasca, from the Quechua words, aya meaning ‘spirit’ or ‘dead’, and huasca meaning ‘rope’ or ‘vine’. Hence, the brew is often referred to as the ‘vine of souls’ or the ‘rope of the dead’. It is prepared by cutting the vines into short lengths which are then scraped, cleaned and pounded to a brown pulp. The vines, along with chacruna leaves and other ingredients are then placed in a cauldron, water is added, and the entire mixture is boiled for 10-12 hours, overseen at all stages by the shaman who will continuously blow sacred tobacco smoke into and over the brew. When ready, the mix becomes a muddy, pungent liquid with a foul, acrid taste. Once ingested, the mixture produces initial feelings of warmth which spread up from the stomach, creating a sense of well-being and a sensation of skin elasticity, almost as if the skin has become rubber-like and pliable and no longer separate from the air around it. After this first phase, which may last 30-60 minutes, the visionary effects begin, which are often dramatic. Harvard ethnobotanist, Wade Davis, in his book, One River1, described the sensation as akin to being “shot out of a gun barrel lined with Baroque paintings, and landing in a sea of electricity”. 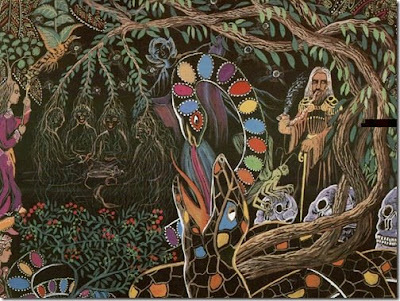 Visions of snakes and vines in bright primary colours are very common but, for the trained shamanic eye, information on the illnesses and diseases which inhabit his client’s bodies are also expected. It is these visions which enable him, and the spirit of ayahuasca, to heal his clients. Conceptual thinking is a limited tool when one truly attempts to develop one’s consciousness. Indeed, human consciousness has a natural tendency to identify with thoughts and reason - stopping there. Shamans use a technology or an outside element, generally consisting of sacred plants. Using powerful psychotropic substances, the Shamans guide individuals, enabling them to “peel away” consciousness from thoughts and reason. The subconscious is gradually unveiled. During these experiences, a different reality appears and is observed through the prism of our consciousness. The film depicts the Shamanic culture and their underlying belief systems which stem from their knowledge of the Invisible. "The objective of this documentary is to impress upon viewers that these little-known Indians developed veritable cognitive technology through their own sciences of the spirit, thousands of years ago. To me, these men are warriors in the battle to unlock the mysteries of consciousness. Shamans consider the greatest ally and the worst enemy of every individual to be one and the same… himself or herself." A night high on Ayahuasca with the Ashaninka of the Peruvian Amazon.